Welcome to the first installment of Keeping Up With K9 Kamp! As you may have heard, we are now official co-hosts of K9 Kamp with Kol’s Notes and Peggy’s Pet Place. K9 Kamp, a fitness challenge aimed at fighting pet obesity, happens a couple of times year. However, we believe that canine fitness should be something you work on year-round. This is where Keeping Up With K9 Kamp comes in. 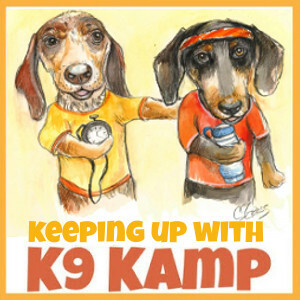 Keeping Up With K9 Kamp is a series of mini-challenges that take place each month that K9 Kamp is not in session. 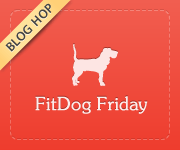 The mini-challenges will help you keep the goal of canine fitness fresh in your mind. The challenge this month is to get an idea if you are feeding your dog the right amount of food. As with humans, the core of proper weight management is controlling calories in versus calories out. It’s important to find the right balance to maintain your pet’s weight, help them lose weight or help them gain a few pounds. Figure out how many calories your dog should be eating each day. The calculators for doing this aren’t super customized (what, no activity choice for hiking?? Ha, ha) but, if you do the best to enter accurate information, the result is at least in the ballpark. The two best tools for calculating the calories needed by your dog are the SlimDoggy (you’ll find the calculator on the right sidebar) and DogFoodAdvisor widgets. I suggest you try both since the information you enter is a little different. The amount of calories your dog should get in day will fall within the range these widgets give you. Figure out how many calories your dog is eating a day. This step takes a little more investigation on your part. Because it is not mandatory for pet food, treat, and supplement companies to list the calorie content on the package you may need to look it up on the internet. This information can usually be found on the manufacturer’s product website. If you can’t find it you can find the closest human food equivalent and estimate the calories (ex. dehydrated pumpkin flakes). Look at how many calories you pet is eating compared to how many they should be eating. If your pet is at a healthy weight (check out this handy body condition chart to see) then you don’t need to change anything regardless of what the numbers say. If your pet could lose a few pounds then make sure the calories they consume are at (if they are not already), or less than, the recommended calories. If your pet needs to gain a few pounds, increase the calories. An adjustment of 50 – 100 calories either way for a a few months might do the trick. I know what you might be thinking….because I certainly was – I read the package and what I feed my pet is within the recommended range. I did this exercise myself and was kind of surprised at the results. I’ll share those with you at the end of the month. Please give it a try and let us know if you gained any insight from it. * You are encouraged to let us know how the challenge went for you on our monthly wrap-up blog post by writing your own blog post and linking it up to the hop or or leaving a comment on that post. The idea of K9 Kamp and these mini-challnges is to work toward a common goal and offer each other support. Please tweet and post photos using the hashtag #K9Kamp throughout the month so we can keep in touch and see what fitness means to you. We did those calorie calculations when we first saw the slim doggy app and were totally shocked as we were right on! We don’t snack much, so snacks don’t throw our counts off much. Love that badge – so cute! Thanks for starting the Keeping Up With K9 Kamp idea! Great. Did you write a post about it? You could link that older post up at the end of the month or at least come back and chime in with a comment. We’re really looking forward to what folks find when they run through this exercise. I know everyone we talk to usually is. Thanks for joining the Hop and posting the widget! The SlimDoggy widget and iPhone app also shows calories, and ingredients, for most dog foods and treats. If using the widget, click on the “Food Rating” tab and you can do a look up of your dog’s food. Thanks for the reminder. Unfortunately, I couldn’t find Acana on there when I looked. Did I miss it? Congratulations! Your blog has been chosen a finalist in the 2013 Petties in the category of Best Active Living Blog. Voting for finalists is now open through July 31, 2013, so let all your readers know! Please contact me so I can send you a finalist badge to place on your site. The winner in each category receives a personalized Petties trophy and a $100 donation to the non-profit 501c3 shelter or rescue of choice. Winners will be announced in an online ceremony in September. More details on the ceremony to come. Congratulations on being a finalist and good luck! OMG…that’s great. I see I have some stiff competition though 🙂 Where do I contact you? You can send the info privately through my blog contact form. That’s great, thanks. I am still waiting to hear from you on the badge. I don’t know your email. Should I use the general DogTime email? Correction on the prize in the 2013 Petties if you win in your category – it’s $1000 donation to the non-profit 501c3 shelter or rescue of choice along with the personalized Petties trophy. Glad you are going to give the exercise a try. I feed Chester and Gretel a lot of treats too so I give them a little less food than they need to compensate if necessary. I do the same really (or similar) – go by the way the dogs look and what they weight and adjust food accordingly. The idea of this exercise though is to put numbers to that method so that you have a reference point if you change food, and thus the calorie content of that food. When I switched to gan-free kibble, the calorie content went up by almost 20 calories per cup. If I didn’t know the amount of calories the dogs were currently eating, I wouldn’t have been able to make an accurate calculation of how much of the new food to feed them. Instead, I would have had to go with the product recommendations on the package and possibly have to react to weight gain if it happened. You had me worried there for a minute because I’ve been going off of k-cals for years now and I was pretty sure that they were the same as cals but I thought you were going to tell me something different! Whew! I do the same as you, I use the recommended calories as a guide but hands on works a lot better for me. Our activity is more in the winter than in the summer so I adjust accordingly. I do wish that it was a requirement for dog food manufacturers to put the amount of calories in each cup on their food bags. There are quite a few who don’t.